I love the dress, but that blazer was so unnecessary. Even if she was required to wear it as some to add some formality to her look, she should’ve worn it properly as it’s too structured to be slung over the shoulders successfully and comes off looking awkward and bulky. The crossbody bag feels too informal. This was a meeting at the Commonwealth with delegates. Not brunch on Solane Square with your gal pals. My sentiments exactly. This is such a miss. The blazer slung over the shoulders looked absolutely dreadful, esp from behind. Like she was hiding a hunchback or some weird contraption underneath. The pic belowe illustrates perfectly why this 80s throwback blazer with padded shoulders has to be worn as it is intended to - properly and not "I'm too kool for skool coz I'm Megsy." Her whole outfit, the jewellery, it all just screams "informal" and is just not fit for purpose. Don't even get me started on Eugenie today. PS Not to mention overpriced. Throwing so much money at sth and looking like this.. smh! The dress is cute for brunch or whatever, perfectly put in the blog post, but still shockingly overpriced for a dungarees inspired casual dress!! I would've chosen this as the dress I wore to the event. It fits into that niché of casual enough depending on how you style the accesories but classy enough to look polished near delegats. Camilla smirks and mugs and does not know how to behave at this event. IMO. 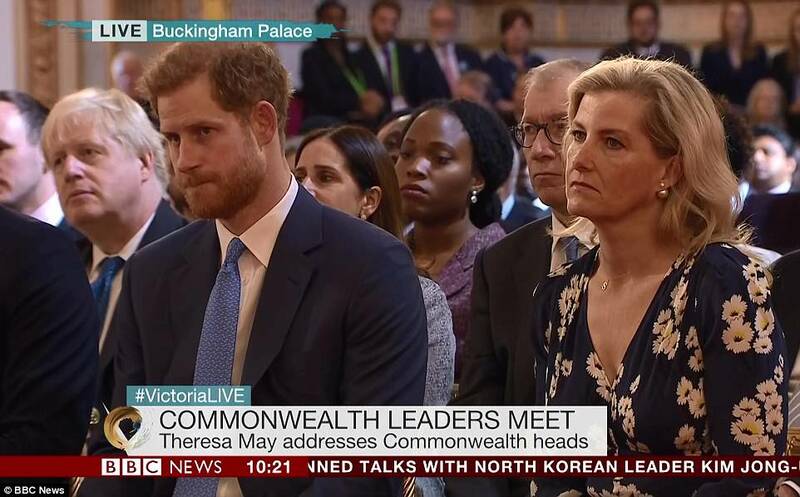 I hope this is all in the right threads, as it's all commonwealth stuff. This dress is good, though as per protocol black is a no-no which everyone seems to ignore anyway. I like the dress and it's affordable (266 GBP, not heinously expensive and then cherry on top, inappropriate and/ or fugly). imo she should stop bronzing her cheeks, like Kate should do away with the blusher, it photographs terribly. The bun is tidier, and thank goodness she isn't fidgeting with her hair. I noticed that. Chucky wasn't much better behaved. He still is putting out the nauseating spin about Camilla. He should be grateful his mother is talking him up but he still apparently isn't satisfied. He never is. How and when will we know if Prince Charles will succeed the Queen as the head of the Commonwealth? I agree with Dickie. I think that Charles will get the position and Harry will assist him regarding the younger generation. I can't decide if they are angry, trying to concentrate or what. 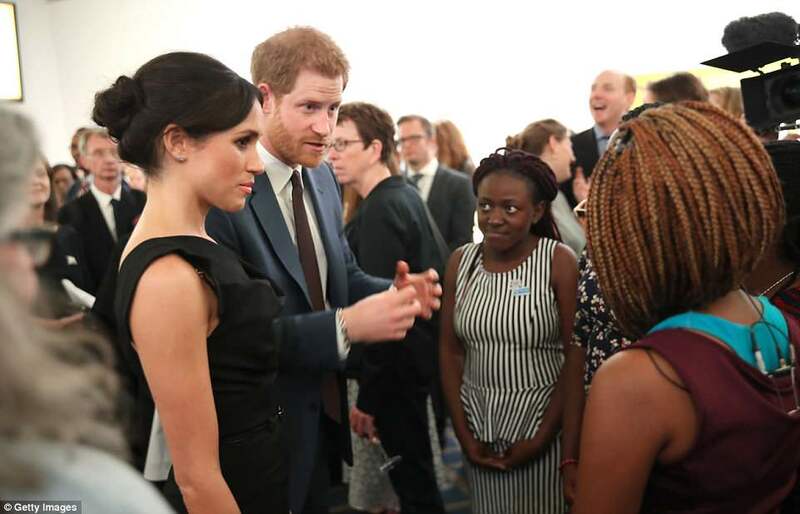 Harry assists Charles with younger people in the Commonwealth. Most of the leaders had already come out and said that they supported him in to take over from his mother as the figurehead Head of the Commonwealth. In Australia, for instance, he had the support of both sides of politics to have this position - even though the leaders of both sides would like Australia to be a republic.